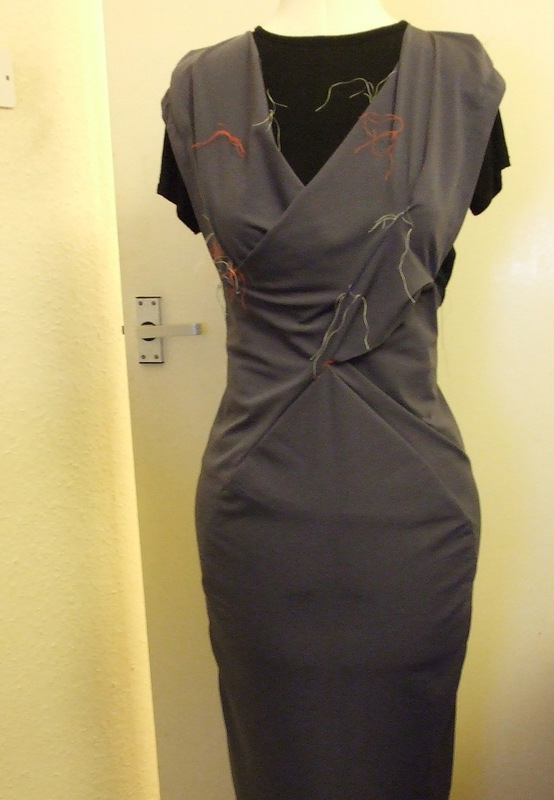 I’ve been making another version of the Burda September 2010 cover dress. This has been a fairly popular pattern in the sewing blogosphere – there have been quite a few reviews on Pattern Review. I’ve previously made the dress and the matching skirt in neoprene. However I wanted another long-sleeved dress and I had some mystery grey two-way-stretch knit in my stash, so I decided to make the Burda dress again and put long sleeves on it this time. We’ll gloss over producing pattern pieces for the sleeves, as it took about a week of head-scratching and indecision. Suffice it to say that I eventually just used the sleeves from McCall’s 2401, a pattern which is approaching TNT status in my collection. I didn’t fit as I went on this one because I’d already made the dress once and got the fit sorted. Unfortunately something strange appears to have happened when I added seam and hem allowances to the pattern for the knit (the neoprene doesn’t need them so I hadn’t put them on the first version of the pattern pieces). 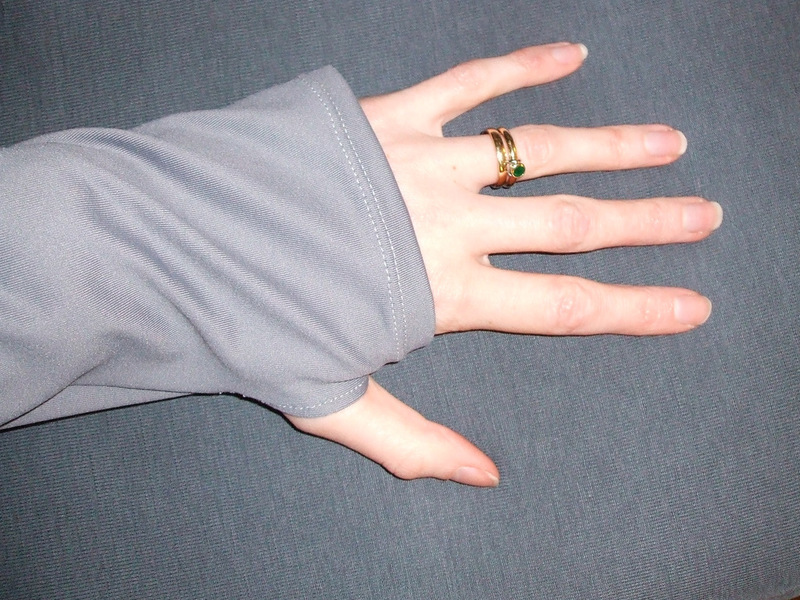 The front hem came out about 3cm longer than the back, and the sleeves ended well over my knuckles. Again. I chopped the hem off until it was level, which wasn’t the end of the world – guess I added hem allowances to the front and not to the back. 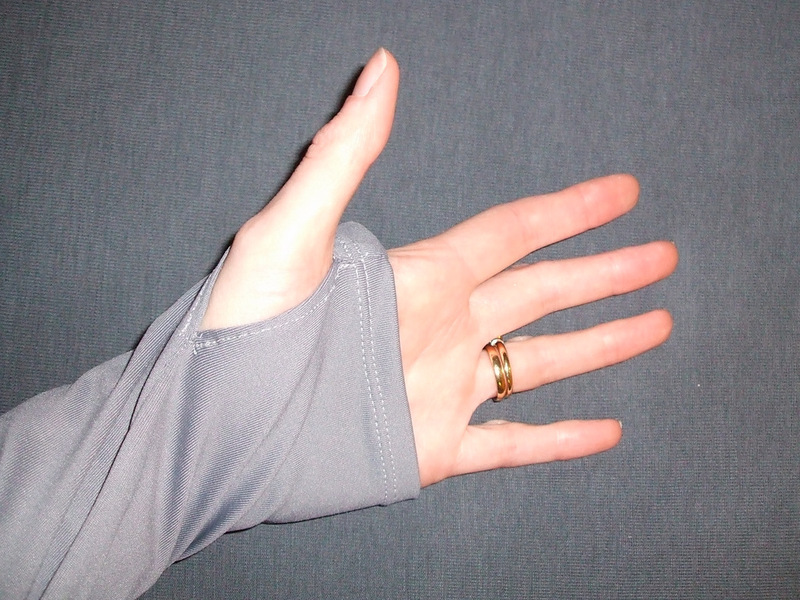 However I have permanently cold hands so I decided to keep the extra-long sleeves, but make a thumb hole in the sleeve seam so I don’t have to push them up to use my hands. I just unpicked about 5cm of seam and sewed round it on the right side to hold the seam allowances in place. It’s not the neatest thing I’ve ever made, but I had such trouble with skipped stitches and thread breaking and mysterious bobbin tangles on this project that there’s no way I’m unpicking and trying again. I’m not sure the size 80 ballpoint needle I used was up to the job on this fabric. You can see the mess if you click to enlarge on this view. I’d show you some photos of the whole dress, but my photographer is away and for some reason it looks terrible on my dressform, although it’s OK on me; probably time to go and check my measurements again and adjust the dressform! Hopefully we’ll get to take some next weekend. For some reason I’ve never much liked styles with lots and lots of buttons. Now I think I finally have found out why. Can anyone tell me the secret to sewing on buttons and making the things stay put? A few months ago my other half got a great new coat from an Army surplus store. A proper coat, with buttons. Lots of buttons. Shortly after we got it, one of the buttons came off. I offered to sew it back on, only to discover that the problem was that the shank of the button had broken so I couldn’t just reattach it. The buttons are a distinctive style and the coat hadn’t come with any spares, so I replaced them all with a different set. This took quite a while but I figured it was worth it. And then they started coming off again, one by one. I sewed them on with stronger thread. They fell off. I sewed them on in a slightly different position so there would be less strain on them. They fell off. I sewed them on again over a pencil rather than a matchstick, to make a longer gap between button and coat. They fell off. Even the ones that there should be no strain on at all are coming off now. 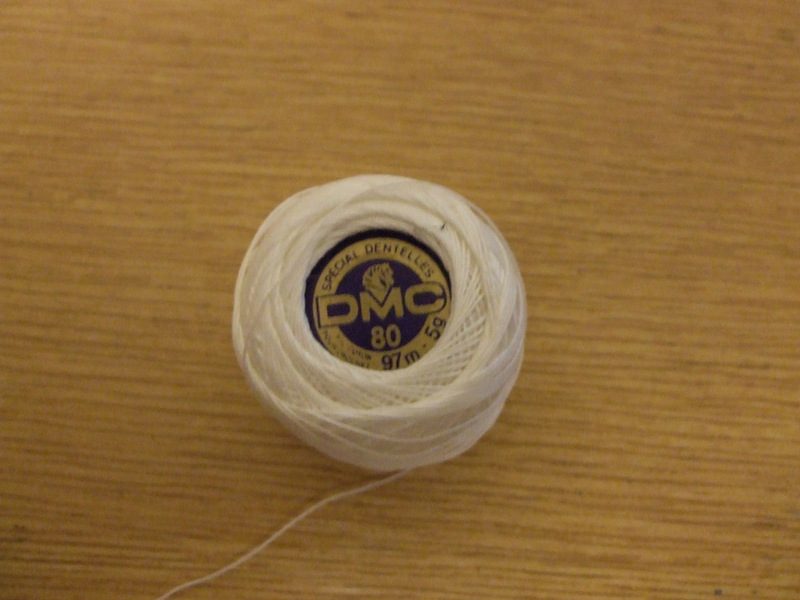 On Saturday I went to look for superstrong thread and beeswax in town, having heard that waxing the thread helps, but came back empty handed on both counts. So I’m completely stuck as to what to try next. Can anyone give me a hint? In other news, my muslin of Vogue 1087 is coming on. I’m about halfway. Here it is pinned on my dressform. It’s actually starting to look like a dress now. There are 38 steps in the instructions. I’m on about number 14, but as I am planning to miss out the zip it doesn’t feel like I’ve got much more to go! I dashed to John Lewis after work today and they had the perfect red cupro lining to go with my red wool fabric from Glasgow. So in theory I’m all set for the next stage of the long drawn out Vogue 8667 project, which is to make the lining using my altered pattern pieces to check the fit. But I need to shrink the lining and the fashion fabric first. I’m doing the bin-liner/garbage bag and wet sheet method described here for the wool, and I’m putting the lining through the washing machine. Unfortunately it’s started raining and the forecast isn’t good for the rest of the week, so there’s going to be a lot of wet fabric hanging over the bannisters drying very slowly over the next couple of days. I did remember to measure the wool before stuffing it into the bin-liner (62″) so this time I’ll be able to tell if it really shrinks very much. I also bought new thread. Buying thread was one of the things that really puzzled me when I started sew. 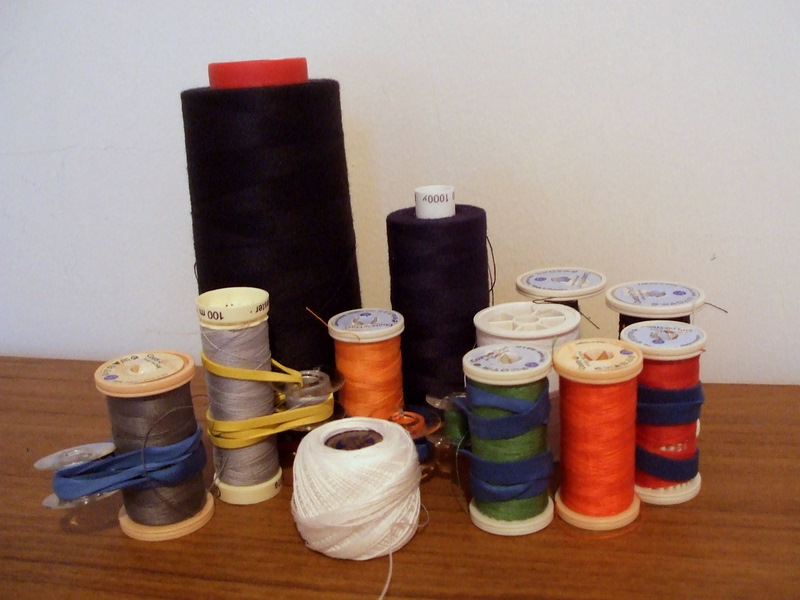 How much thread do you need to buy for a project? I seem to get through nearly 300m for a lined dress (three reels in the size I can normally get) but a skirt might take less than 100m. Obviously it’s going to vary a lot depending on how the seams are finished. 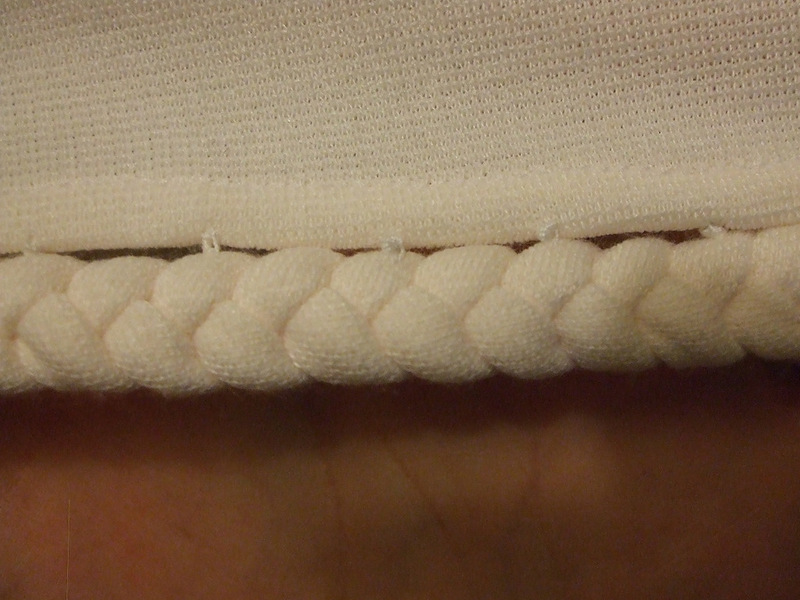 I zigzag mine using my machine’s overcasting foot and that eats up thread. I usually buy an extra reel or two just to make sure I’ll have enough to finish the seams, and so I have accumulated a shoebox full of reels. Many people seem to feel a bit guilty over their fabric stashes, but I find the thread stash is the one I want to reduce. I will probably use everything in the fabric stash up at some point, even if only for muslins, but when will I ever use up six reels of pale green thread (two each of three subtly different shades)? I don’t know how I even came to have six reels of pale green thread in the first place. But for whatever reason I didn’t have any red thread (day-glo orange and dark rust don’t count) so another few reels have had to be added to the collection. So I have new red thread, red zip, red lining, Vilene bias tape…just waiting for my fabric to dry!